I've told quite a few people that one of the best purchases I've made in terms of kayak fishing gear was a Lowrance map/fishfinder unit and satellite imagery map card. Having the map on and at arms length all day long lets me make way better decisions on the water, as I figure out the pattern for the fish and look for areas that look similar to where I'm having success. It's also very handy to see old tracks laid over your current track, so you can confirm that you are indeed in that one spot that was so awesome that one time with similar conditions. That being said, the Lowrance interface leaves a lot to be desired, and I'd much rather store the tracks along with the rest of my notes and mapping, in my Google Earth files. Unfortunately, that isn't exactly a straightforward process, so I thought I would make a short post outlining how I do it. Please keep in mind that I am doing this on a Mac. I don't think the process is very different on a Windows machine, but perhaps someone can confirm that. I'll run through the steps, but in essence, we will be saving the tracks to the card while the card is still in the Lowrance, then putting the card in the card reader, selecting the file with GPS Babel, and translating it into the language that Google Earth can understand. STEP 1: On the Lowrance, navigate to "Waypoints, Routes and Tracks", hit "Menu", and hit "Save to Card" Name the file, hit save. STEP 2: Remove the card from the Lowrance, insert in the computer's memory card reader or external reader. Step 3: Open GPS Babel. The button labeled "File Name(s) in the top LH corner is where you will tell the program where to find the source file. Click on it, and navigate to the memory card, and look for your file. It will have a .usr extension. In the drop-down menu of the input section of GPS Babel, choose "Lowrance USR" as the format. 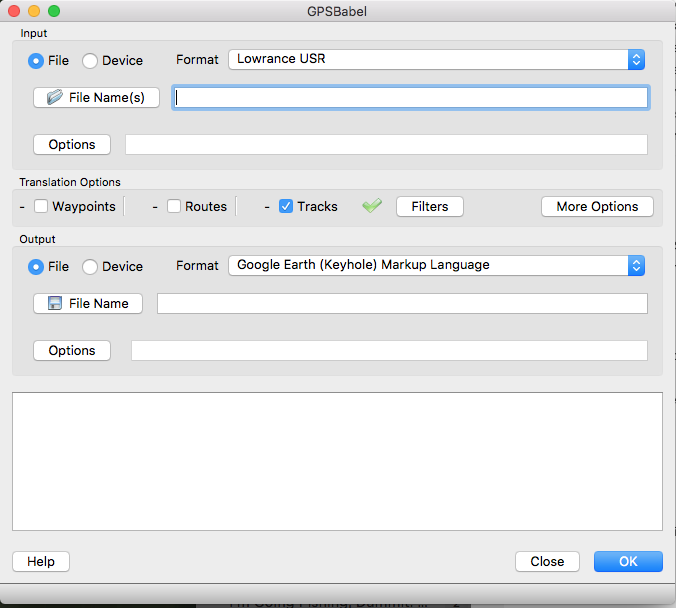 In the output format, choose "Google Earth (Keyhole) Markup Language" In the output section of GPS Babel, click the "File Name" button, and choose a destination for your file. Click "OK", and let the program run. When it comes back as successful, close GPS Babel. Navigate to where you saved the file, hold control, and click (right click on Windows), then navigate to "Open With" and choose Google Earth. STEP 6: The file will load into Google Earth. Let it go, it may take a minute. This is where you may get frustrated. IT MAY SEEM LIKE GOOGLE EARTH IS FROZEN. Don't kill the program or click out. For some reason, and especially if you have a lot of tracks, it is extremely slow. 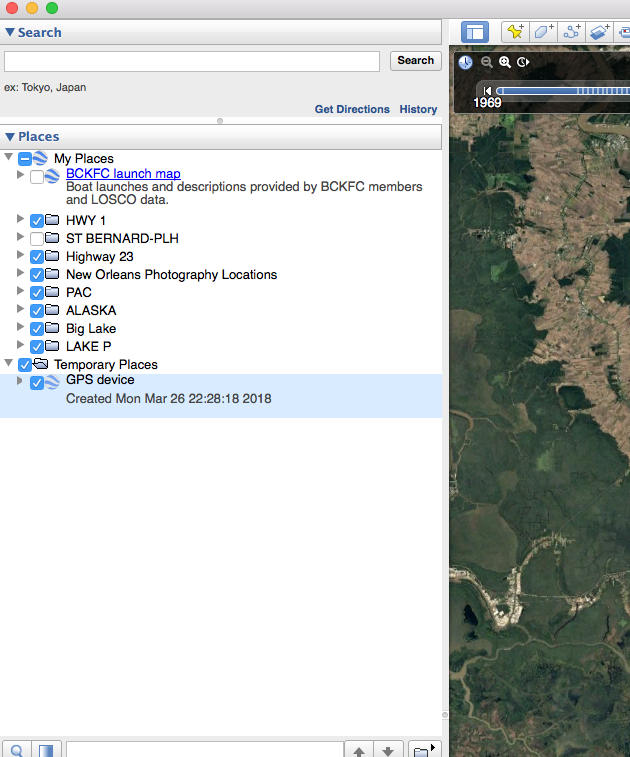 Let it load everything, then look in the "Temporary Places" folder in Google Earth. STEP 7 Immediately deselect everything in the "Temporary Places" folder, by clicking the check box next to it. Again, it will take a minute. Don't click twice, or you will drive yourself nuts. STEP 9 Last step! 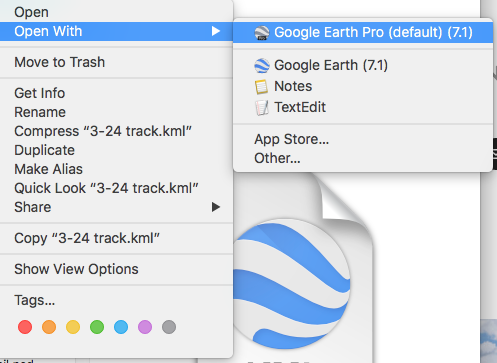 Drag the now-renamed path to the folder of your choice in Google Earth, and hit File->Save My Places. You want to do this after each track you save, because Google Earth will occasionally hiccup and you may lose your work if you have to restart. Also, this is VERY IMPORTANT: Google Earth does not auto-save. You need to manually save every time you work on the map. Don't ask me how I know.